Excellent program. Plenty to do. Interesting programs. Such a wonderful place for family. Everyone cares so much and are so helpful. Beautiful, well-maintained grounds with scenery to match. Above and beyond care to seniors. I enjoy being here at Eskaton Village. I am in a cottage. What they provide is great. I can't complain. The food is okay. There's a big variety. We don't all like the same thing. I haven't got involved too much with activities. The rooms are great, especially what I have is a 1-bedroom, with the living room and kitchen together. It's very convenient. There's a variety of living areas, for those that need care and for those who need basic assistance. The setting is very good also. The location is in a very inviting area. I enjoy it here very much. The whole area of Placerville is nice. We are so happy to hear you enjoy living in your cottage. The one-level open floor plan is designed for aging in place with no steps around the home. Whenever you'd like to join us for an activity, we'd be happy to have you. Jane Young, the Life Enrichment Director, designs activities for the interests of the residents. Just tell her what you like. Eskaton Village is very good. The staff is very good. I've been here 10 years and I've never been annoyed by anything they've done in any way. They're very courteous and effective. They're great. They have exercise groups, calisthenics, and the staff seems to be effective in doing the job. I've spoken to several people who are residents themselves and those people have a pretty good setup, and they have no serious gripes about it. There are various setups involve. There are 39 cottages, and the people in the cottages, as I've been told, they get 45 meals a month for the rent. We really enjoy our activities, very friendly place to live. All the staff are very nice to deal with. Beautiful location with beautiful views. The staff was so nice and helpful. The food was amazing. I can't wait for my parents to move here! I recently had lunch with a good friend who is a resident at Eskaton Village Placerville. I was very impressed with how wonderful the facility is. The staff greeted me and made me feel like I was welcomed there. I noticed right away how clean and inviting it was. We ate a delicious lunch as we sat there enjoying each others company. I could tell the residents all loved enjoying each other’s company as they sat there conversing. What a great place to be and great place to live!!! Visited the facility recently to see a dear friends mom. Definitely not what I expected. Beautiful grounds and very friendly staff. For anyone ready to move their loved ones into an assisted living situation, I’d highly recommend checking this place out! EVP community is the best place for my parents to stay. Safety, cleanliness and quality of care are their priority. If you have concerns, they do necessary action right away. Activities and special programs are great. My mom always attends the great events. They have all kinds of activities. The management and staff are knowledgeable and professional. They are always ready to help with a smile on their face. They have well trained and accommodating employees. Place is well ventilated, clean and secure. All staff is nice. The place is well maintained and will recommend it to others. The staff is accommodating and the place is clean and in order. I like the place. The staff is very accommodating and observed that they are very passionate and dedicated in doing their job. They are very well trained and showing patience. The place is secure with complete facilities. The employees are very accommodating. The staff is well equipped on how to take care of the elder patients. They treat the elders like their own parent. The nursing home is very clean and with complete facilities. I am happy getting the highest level of care. Good job EVP! Staff members were courteous and hospitable. I was impressed with the way they handled their residents. No word is enough to describe the beauty of this community. It's by far from all the rest. I am giving them a++++. such an outstanding community with caring, loving and professional staff . Lots of activities that keep my loved ones busy and active. I highly recommend this place. Truly a 5 star place. Fantastic day for me. Eskaton is the Gold Standard for senior living and care. I am very happy with Eskaton Village facility and staff for my mom. The staff is very responsive to needs. They are warm and friendly and care about the residents. Thank you Eskaton people, whom I love very much. You are helpful in every way. I hope this will be my home until God calls me home in heaven with my Lord and Savior Jesus Christ, and my dear husband, who is already waiting for me. Nice family day, including the food and entertainment. We really enjoy Eskaton. They take good care of Kelly! Everything is very clean and well taken care of. That is the main thing that we like about being here. The personnel is also the best! We like all of the staff! Very nice to see the little kids having so much fun during family day. Hotdogs and popcorn very good. Service is good, friendly and helpful. Very nice place for the residents who live in this mountain paradise. Friendly staff, good food, and plenty of activities for all. Great community, friendly staff members, awesome events and activities, highly recommended! Beautiful location, friendly people, caring staff, good food and a safe and lovely place to live. I have been in Placerville for 5 years and it has been a good experience. The setting is pretty and peaceful. The staff is caring as possible. I like it here. Nice surroundings and very friendly people. A great community. The bistro is well managed. My mom lived here for 8+ years and was ALWAYS treated with respect and kindness and compassion. It was her home, and she enjoyed many friendships with residents as well as staff. I highly recommend this place for anyone who want s a quality of life and safe and beautiful surroundings. Love the.concepts of the events, showing care and.love for the residents. Eskaton is a very nice and clean place. Staffs are welcoming and pleasant. They have superb facilities. They always offer variety of events and entertainments. Eskaton Village was positive and good. The staff was friendly and accommodating. Most of the residents were happy but a few were bored. My mother has resided at Eskaton for two years now. I cannot say enough good things about Eskaton Village and the wonderful, well-trained and caring employees. My mind is at ease knowing that she is always well cared for when her family is not with her. Lots of activities and excellent food. A welcoming and comfortable home for my mother. As a volunteer, I enjoy watching the residents do activities that help them with their eye and hand coordination like balloon volleyball. Everyone plays along with the residents. Also the type of music that is played, the residents sing along and enjoy listening to it. Overall good care. I make sure my mom is taken care of well, so I go in at least once a week. Everybody is very friendly. The doctor said my mom looks well and seems to be taken care of well. It is a wonderful thing to know that your loved one is in the best possible place. We feel our mother is clean, well cared for, and in a happy nurturing place. Everyone here is competent and pleasant and makes us feel welcome when we visit. I have been a volunteer since August 2014. I help out with activities and outings. Eskaton does a fabulous job planning fun and practical activities for their residents. The residents are genuinely happy and well cared for. I do hope when my time comes I can stay here. Eskaton is a nice facility. It’s clean and they seem to care about the people. The staff that toured us was very capable. The dining room was pretty nice, but it was a little cramp. I liked Eskaton Village, but they didn't have anything other than a little tiny studio cottage. You get into a studio and move up. I just felt it won't work because we would have to store all of our stuff. It was a very nice studio for one person, and it even had an area around it where you could put in a garden. The kitchen had a microwave and two burners and no oven. It wasn't a full kitchen. There wasn't much storage in the kitchen. They had a nice indoor pool with changing rooms so you don't have to go there in your bathing suit in the wintertime. They had little cars that can take you around the village to various places. If you don't have a car, they will come and pick you up. We ate there, and I was a little disturbed in the presentation of the food. I asked for some cottage cheese and peaches, and I expected a plate with a little dab of cottage cheese on it and a peach, but I got a bowl of cottage cheese with diced peaches on it dumped on top of the cottage cheese, liquid and all. Wonderful! We love the staff, every staff member treats all the residents with love and respect. They brighten my mom’s day and tuck her in at night with loving care. We are thrilled to find such a perfect home for my mom. The caregivers are helpful and caring. The administrators are very supportive. This is a positive experience. The staff members are wonderful. We are there almost daily and see how they interact with the residents, treating them as family. When we can't pop in we know mom is in good hands. We visited Eskaton Village Placerville. The only thing I did not care for was that the community itself felt like it was out in the boonies, and I felt "Oh, my God! If there is a fire, how can everybody go out?" There was a long road to get to the Escalon in Placerville. However, the people were superb. The place was very fresh. The activities really worked. I had not eaten the food, but it looked good. The menu looked superb. They had chefs there. They had facilities like rooms if you wanted to have the whole family group there. They had the same types of outings, and they also took people to doctors' offices. They do crafts and they had little examples of what people had drawn. I thought that would be fine. They also had a game room. They also had a movie room. If my mother-in-law had not chosen the one she was in now, we would be happy with that too. They seemed very competent. They had monitors. If somebody went into the bathroom like 40 or 50 times, then it was okay and alert or if nobody went in and out of the room, that was alert also. So, they were very into making sure that the residents stayed healthy. Eskaton Village Placerville was great, excellent, and incredible. It was clean, well-maintained, and looked nice. The staff was very pleasant. I was very impressed. If we do have to move our grandmother at some point, that would be the place that we would choose for her. My mother is in Eskaton Village. I like it. It is good for my mom. She is much more comfortable. It is a healthier, more nurturing environment. It is good. She has her own room. The food is a lot better than where she was before. I like the care. I like the staff. I like the overall feel of the facility. Eskaton Village Placerville was small. The dining area was OK.
My first impression of Eskaton Village Placerville was that it was very nice and very clean. It was pretty and brand new. They are in a very nice wooded area. A friend of mine had placed her mother there. They have assisted living and then they have where you really actually need a lot more help. The community was beautiful and very clean. I had visited my friend's mom there and I just like it. For accommodations, the assisted living ones were like very large bedroom and very large bath. They did have a nice little living area and a little kitchenette that had a microwave and a little refrigerator. They were very nice. They also offered cottages and little houses with garages. They did have one-bedroom and two-bedroom cottages. They had high ceilings and they were really roomy. They had little cooktops. They were nice. Everything was clean and new. For activities, they did have all kinds of things. At that time, they were painting. They also had transportation that would take them to doctors, etc. I had seen the dining room and the menu. Actually I was impressed with their menu. My friend's mom has said that she does enjoy the food there. I visit my grandmother several times a month and i got to know a lot of the staff at the facility. They are very nice and friendly. They look happy and enjoy their work. My grandmother loves the caregivers. She said they take care of her like a queen. Over the course of eight weeks I volunteered one hour per week at Eskaton Village, and despite my initial apprehensions, I found the facilities comfortable and quickly came to look forward to my visits. My principle task as a volunteer was to facilitate a Wii Games activity hour, other activities included Bingo, Art, and Yoga. Various off-site activities happened on a weekly basis, such as trips to the store or casino. The staff was very friendly and professional; effort was made beyond suiting physical and medical needs of the residents to provide a social atmosphere while respecting privacy. Compared to the old school nursing home this felt like a resort, no hospital type of feel in the assisted living areas. This community is exceptional in the way they provide care. My mother lives in this place and the staff is absolutely wonderful, bar none! They treat you like family and not just a client. Look no further, this is a very clean, beautiful and nice place for your loved one. My parents moved at Eskaton when it opened over a year ago and they are very happy with the caregivers and all the staff. Everyone is very attentive to the clients who live there. I visit regularly and I've seen enough to say they do an exceptional job. When I first started looking for an Assisted Living for my Dad, I looked at 6 places. I was impressed with this community. I moved my Dad almost a year ago and he is very happy with everything about Eskaton. The staff is great including the Administrator who is very friendly and accommodating. I'm really surprised about the negative review. Anyway, I hightly recommend this place. It was very hard to think about putting mom in an assisted living facility. She lived with me for over a year and I watched her slipping farther away each day. We looked at a lot of communities and decided on Eskaton in Placerville. It is absolutely beautiful, clean and the staff is so loving and kind and very capable. Mom fit in immediately and is always saying how much she loves everyone who works there. She recently fell, when visiting relatives and the added concern and care upon returning to Eskaton has been superior. Her memory has actually improved since she moved into Eskaton. I'm sure her improvement is because of the added activities and socializing that the staff has provided. They are good at notifying me if there is ever a problem . She considers Eskaton her home . Excellent fitness classes, activities and events for the senior population. Friendly, caring staff. 24-hour security patrol. Beautiful swimming pool and spa. Beautiful community setting, but landscaping around homes and in common areas leaves much to be desired, and is not maintained as well as I would have expected. My daughter lives in the area and she saw Eskaton Placerville on TV. We came in and visited. I was impressed and bought one of the houses right on the same day. I have a wonderful experience here. They have cottages, people that are in the lodge and people that have their own homes. I'm one of the one who owns their own home and Im very happy with it. The dining and the food are very well too. I'm very happy with it. Sometimes, I have lunch there and sometimes I make my own. I'm very happy with the activities as well. When I'm a resident I can still participate in any activities that they have here at the lodge. I can have a swim in the pool or do anything that they offer. Anytime I need anything or something go wrong, I call them they're right on the spot. It's everything that they said. I'm VERY happy here! I always enjoyed the indoor pool and other great amenities. My experience has been positive since day one. I love the fun and wonderful programs. Moving here was a great decision. Very nice staff and friendly place. The activities are so fun and entertaining. Eskaton Village Placerville goes above and beyond to provide activities for the residents and their family. Eskaton Village Placerville is such a beautiful place and packed with fun activities. There is truly something for everyone. Eskaton staff is professional, very pleasant, caring to residents. Residents are always occupied in activities and events. Stunningly beautiful -- this looks like a fabulous home for my loved one. The atmosphere is extremely friendly. Thank you for making my choice easy. Looking for place that treats seniors with respect, kindness, cleanliness. This village is superior. It's a great place in Eskaton. It's like my second family. The services and our treatment are all very great. I was so amazed at the friendliness of the staff. The building and rooms were very clean and modern. Lovely facility. I come to see my friend and he's blossomed here. The community center and pool are wonderful, and the staff truly care about all of the residents. I hope to be so well cared for when my time comes. I recently visited this community and was very impressed by the quality of this place and the amenities it has to offer. The residents seemed to be enjoying themselves and the staff were very welcoming. The property is also very well kept! So thankful my dad is here. Grounds are lovely, and secluded enough that you don't feel like you're in a city. Still close enough to town that we can take him out to dinner and spent the day with him. Staff is wonderful and attentive. Still have to deal with day to day issues, but him being at Eskaton makes it a bit easier. A wonderful place to live for seniors. Clean and beautiful with compassionate staff. Highly recommended. Thanks Paulie for visiting Eskaton! The activities provided at Eskaton Village are excellent! The recent Family Day event was very enjoyable. It was a nice opportunity for residents, employees, and families to mingle. I have heard many positive comments. I am so impressed with the care and great interest the wonderful ladies show all residents. They make "us" feel really special to them and show loving care with each. A great group of people who have made wonderful friends. Congratulations on your wise choices. All good people who geniuinely care and are interested in the individual tasks and clients -- great job. I LOVE the wide and fun variety of events. Eskaton Village is a beautiful facility and the community environment is so warm and friendly. The staff are very supportive and caring and really do exhibit "the family atmosphere" for all residents. the BEST Eskaton community ever!!! I live in the cottages, so I don't need care yet. But I love the "events" and "outings" Eskaton plans for us. Jane is excellent at her job and so is Guy! The dining room staff is always kind, helpful and polite to us! I've received very good services since I've been here for 2 years. Everyone is very helpful. The exercise classes and entertainment is wonderful. Thank you. I have many food and chemical sensitivities. I lived in the lodge several months, and a cottage a year and a half, which was indepedent living. In both situations, Eskaton worked very hard to accommodate my extreme needs. We moved here because you don't have to pull weeds or mow the yard. It was an ideal move. We chose this place because of the location and the convenience of everything. It's close from town and you don't feel you are detached from things. I was very happy when I was brought here the first time. I liked the way it was laid out. I walked in the cottage and it was like home. There is a big room called the den where I have my desk and cedar chest. You are not bothered with traffic noise. It's very private. We looked for 2 years. We visited places in Palm Springs, Roseville, Carmichael, and we found a jewel here in Placerville. Since moving in years ago, I have been very satisfied with the care and staff has shown me. My apartment is cozy and I feel at home. The staff is friendly and open to suggestions. I enjoy all the activities offered. The employees here are thoughtful and seem to anticipate needs before we know what we want. The level of care here is excellent. When you look them over, this is the best one around. In a cottage, you are free to do what you want to, go to activities in the village center, take walks, take the bus. If I didn't drive, I can sign up to go shopping. I love this place. I love the people. All services here in the lodge are excellent. The staff are all amazingly caring and supportive. They have become our friends - in the way we think of them. My only area of discontent would be the preparation of the food; it was so much better a few months ago. Dining room - they serve you. They know your name and ask what you want. If something isn't working, they will get to it as soon as they can. They have a bus that takes you to a doctor's appointment. That really helps. We chose an independent living cottage at Eskaton in Placerville for my mom. The grounds are nicely kept, and the facility is beautiful and really nice. The gentleman, Neil, was very gracious and showed my sisters and me around, then treated us to lunch there so we got to eat some of the food. It was a nice visit. The food was great, and the dining area was nice and clean. The waitresses were cheery and acknowledged the people they knew who came in. When you put your own furniture and your own touch on the rooms, it becomes your home. Otherwise it’s pretty austere, but it’s nicely planned out. Eskaton Village was a very nice, large, warm community with independent-living cottages. They take dogs and they even have some homes on the grounds that people can purchase that are not necessarily senior-living facilities. The grounds were spread out, really lovely, and well-cared for. The location is in a rural community in the hills. They took me around the grounds and showed me the recreational areas, swimming pool, exercise room, and library. Eskaton Placerville Memory Care was the fourth and last place my father lived with advanced Alzheimer's. They were by far the best. Their caregivers really do care and respond quickly to any request or issue. They respect and engage with residents - even if they are wondering the halls in the middle of the night or are agitated. They make sure they are nourished, kept clean and comfortable. It takes a very special person to work with residents with this cruel disease. I hold them in the highest regard. They helped my Dad and my family to the very end of his journey. I will never forget their support for me in my Dad's final moments. I am eternally grateful. Wonderful place. My mother has been through all levels of care here, and at present is in memory care. It is very much her home and the staff is very kind. Our mother has been a resident at Eskaton Village Placerville for 7 years, mostly in Memory Village. It is difficult having a loved one with dementia, but everyone at Eskaton Village Placerville has made it the best possible experience. It's a really nice place to visit. EVP has beautifully decorated, comfortable, and inviting spaces, and it is always clean. The RCAs are respectful and caring, as is the rest of the staff. If medical care is needed, the staff is great, working with us and doctors. There is plenty of activity for those up to it. We are happy to have our mother live here. My wife is in the memory care center and is receiving good care. She appears to be comfortable with the staff and her home there. I think she has good support and is well cared for by an excellent group of caregivers. I am a volunteer in the memory care unit. The residents are treated with love and respect. They are kind and caring. The residents are happy and engaged by staff in activities and exercise daily. I would trust Eskaton with the care of my family any time. Everything is amazing at EVP. Just driving up Blair Lane to the facility puts you in the mood to enjoy your visit. The setting is beautiful and serene. The management staff and caregivers are cordial, very friendly and ready to help. My wife is in the Memory Care Unit, suffering from Alzheimer's disease and is treated with all the care and respect a queen would deserve. Welcome home to Eskaton Village Placerville (a multiservice retirement community). Eskaton Village Placerville sits nestled among the pine trees of the Sierras "above the fog and below the snow." The 65 acre site provides privacy and serenity on a secluded hilltop, permanently buffered from other developments. Residents can enjoy the delightful views and walking trails, meander through the quaint, historic town, or take nearby Highway 50 to explore the county's many recreational resources. Nationally recognized Marshall Hospital is just five minutes away. The Eskaton Village Placerville community offers independent living, respite care, assisted living and has a wonderful memory care unit. Memory Care - The Memory Care Center is designed to offer a supportive and secure environment for individuals with memory impairments. The Lodge's home-like setting and specially trained staff represent Eskaton's commitment to dignity and quality of living for all residents. In addition, the fitness center has an indoor swimming pool, exercise room, locker rooms, space for group classes (yoga, low-impact aerobics, tai chi), outdoor patio with barbeque are, community room with a kitchen available for events and parties. 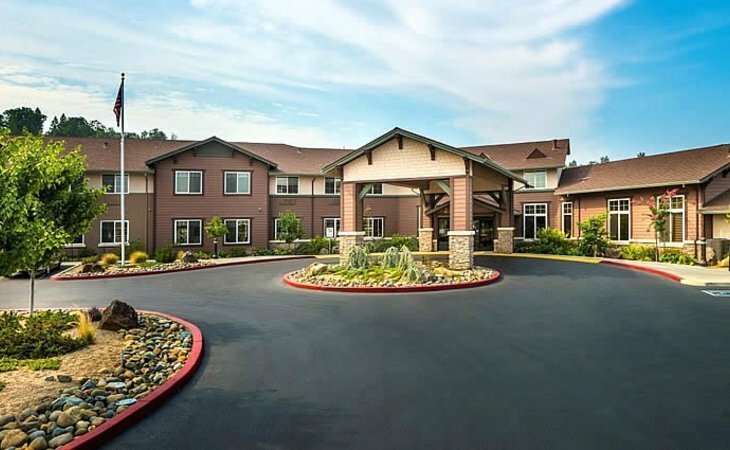 Full of the best amenities and standard of care, Eskaton Placerville offers a plethora of options as your needs change. What should caregivers and potential residents know about Eskaton Village Placerville?